We pass them everyday, as they sway and rustle in the wind, but we often fail to appreciate how vital they are to our lives. They help moderate temperatures, help clean the air, and their beauty provides serenity. To call attention to the wide variety of trees growing in the area, the City of San Luis Obispo’s Public Works Department established the Heritage Tree Program in the mid 1980s, which brings attention to important city trees (15 right now). So what makes a tree a Heritage Tree of San Luis Obispo? It must be either historically significant, of an exceptional size or noteworthy age, have “arboricultural” significance, be an unusual species, or have a distinctive structure. 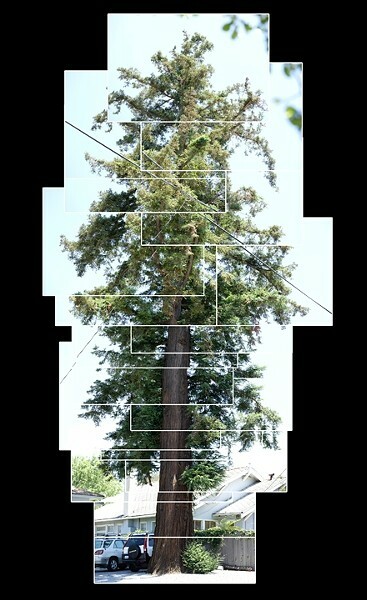 SUM OF ITS PARTS : This Coast Redwood, shown in a photo collage, is one of the SLO City Heritage Trees. To raise awareness of the program, the city is offering free booklet guides to the Heritage Trees of San Luis Obispo with vivid photos, background information, dates of dedication, locations, and characteristics of the venerable giants. It was put together by Eric Geddes of the Geographic Information Services in the Public Works Department, with help from others. “We hope to raise awareness of how much good trees do for us and the environment,” said Keith Pellemeier, maintenance supervisor of the City of San Luis Obispo Public Works Department. The City Tree Committee Advisory Body nominated the first trees in the 1980s, however, anyone can nominate a heritage tree, whether it is on their property or not, and any healthy tree within the city limits is eligible. It must be approved by the Tree Advisory Body and Staff and then designated by resolution of the City Council, according to Pellemeier. The city has lost a few Heritage Trees over the years, and none has been added for more than 10 years. So far there are 15 Heritage Trees of San Luis Obispo, which include three Coast Redwoods, a Dawn Redwood, Torrey Pine, Cork Oak, California Bay, Japanese Maple, California Sycamore, Incense Cedar, Olive, Flax Leaf, Deodar Cedar, Evergreen Ash, and a Western Redbud. The city is trying to increase street trees in San Luis Obispo, and will buy and plant a street tree for those willing to nurture them. “We need to plant more trees in San Luis Obispo, not just the city but every person. Any individual can plant a tree,” Pellemeier said. Booklets can be picked up at City Hall, 919 Palm St., the City Maintenance Yard at 25 Prado Road, and at the San Luis Obispo Library and Chamber of Commerce. For more information about the Heritage Tree Program, or to dedicate or plant a street tree, contact the city arborist at 781-7022, or find out more online at www.slocity.org.